BHS Form 4G 1972, Form Master Mr. Rambley. Back Row L-R: David Sue Hong, Charles Menezes, Percy Newsum, Brijmohan Bhoaj, Rodwell Waldron, Todd Comfort (Cdn.) Evan Chee, Evan Persaud, Colin Peters, Wayne Pearce (Cdn. ), Carl Benonds, Sooksarran Lackraj. 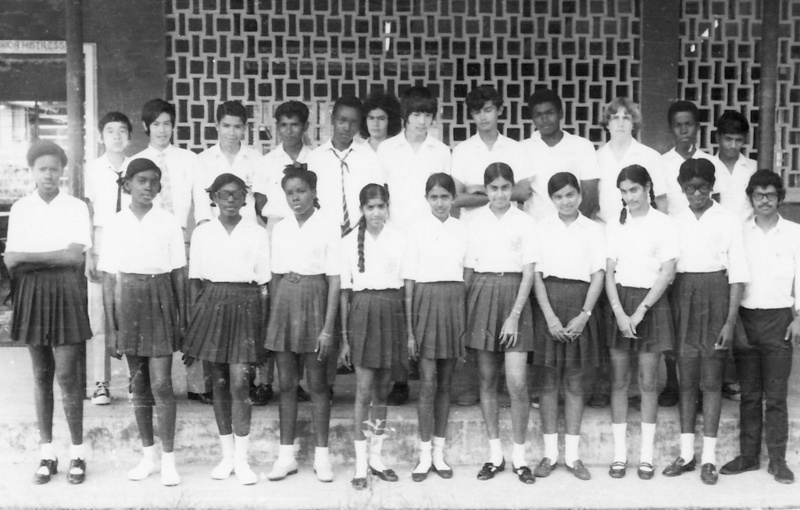 Front Row L-R: Bennett, Valerie Lowe, Maxine Semple, Janice Richmond, Ramdan, Singh, Beigewatti Behari, Tickapershad, Jem Barran, Joan Tucker, Mr. Rambley. Factual Note: Two transplanted Canadians Todd Comfort & Wayne Pearce arrived in Guyana & joined us that year along with two other brothers in another class. They were responsible for us growing our hair to whatever length we wanted after the 4 Canadians refused to cut their hair short as demanded by (SS Storm Trooper) H.C. Buchan with threats of being barred from school. Somehow things worked out in their favour and the rest is history.